The black FSR IPS-WP1Q-BLK Gang Wall Plate provides a flexible way to customize your audio or video interface. 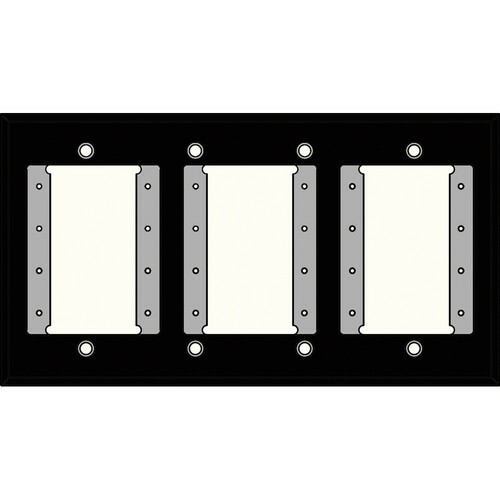 At more than a reasonable price, you can sculpt your system to suit your specific needs and not rely on pre-constructed, factory-set wall plates. With the IPS (Intelligent Plate Solution), your connectors can be tailor-made in a wide variety of combinations. The components are all designed to fit together and install with a minimum of effort. They are available in various colors which will aid you when color-coding becomes a priority. In addition, the IPS system gives your installation a finished, professional and attractive appearance.